Description: Very thin orange-yellow crust. 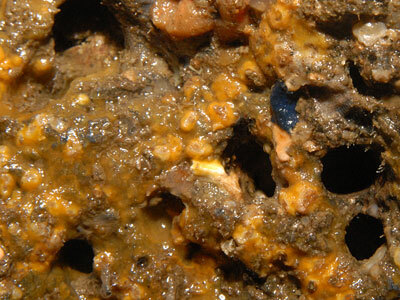 This sponge forms extensive sheets under intertidal boulders. Habitat: Usually found beneath intertidal boulders in areas of strong water flow. Distribution: Shetlands, North Sea coast (Scarborough), SW Ireland, Guernsey, Roscoff. Extremely thin, less than 1mm thick. Picton, B.E. & Morrow, C.C. (2016). Pseudosuberites sulphureus (Bean, 1866). [In] Encyclopedia of Marine Life of Britain and Ireland.